In a set of interviews with E! News this week, Glee cast members spoke on what Madonna songs they'd love to see featured on thew Fox hit. These wishes aren't like a prayer, however: they may actually come true! The show has received permission from the Material Girl to use any single in her catalog, and producers are seriously pondering an all-Madonna episode some time in 2010. 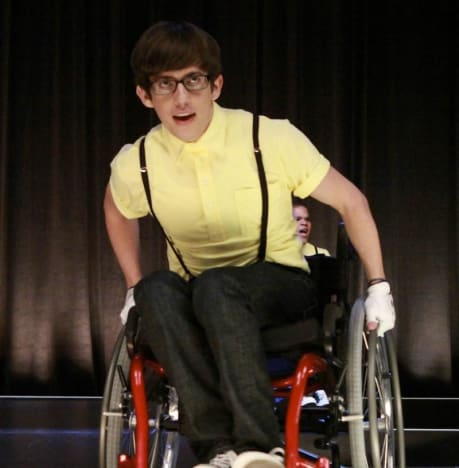 "I really think it would be awesome if Kurt did 'Don't Cry for Me Argentina' from Evita," said Kevin McHale, who plays Artie, and is featured prominently on the November 11 episode. "He could go on top of the school with his arms outstretched. That would be hilarious." McHale, pictured, added: "I just can't wait to see Amber [Riley, who plays Mercedes] do a Madonna song. I know she's going to rip it apart." "I'm really excited to see what everybody sings and how they'll tie into the storyline... I would love to do 'Frozen' in a cape in the middle of the desert." What Madonna songs do you think belong in the Glee music section?